With summer vacations around the corner, family holiday plans are at its peak. Indian families are increasingly travel to international destinations with ease of travel opportunities like low cost airlines and visa on arrival facilities. However, carrying foreign currency still remains one of the top concerns for most travelers. With the launch of the NiYO Global Travel Card, this concern has now been resolved. The NiYO Global Travel Card is the first-ever forex card with ‘zero forex mark-up’. Travellers, using this card, will not pay any currency exchange premium and international transaction fees – unlike a regular forex card. 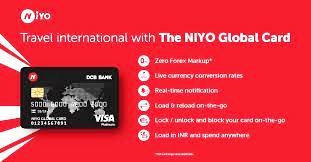 With the NiYO Global Travel Card, the overseas traveller will effectively have no need for the usual multi-currency forex cards or travellers’ cheques – all the while making international transactions cost-effective across 150-plus countries and 35 million merchants worldwide. Besides the cost-effective feature, NiYO Global Card also offers instant digital onboarding, convenient loading from the user’s bank account via NEFT/IMPS. The company’s senior spokesperson would be happy to discuss details about the global travel card, growth potential (market size) and how the launch is in line with the brand’s commitment to offer the entire gamut of digital financial services for its customers.